I must warn you that this review may seem quite political as the movie was about a major political battle that took place in Mexico in the year 1861. I always like to start by rating the movie with an overall perception. Overall, the movie was amazing, except for the actual battle scenes which had a lot of camera movement. I was more interested in the movie's dialogue. The love story was not too heavy which I also liked about the movie. The movie was more focused on the actual battles and historical figures rather than the typical love story you find throughout a film such as "Pearl Harbor" or "Titanic". The story takes place forty years after Mexico has gained political independence from any sort of empire. Mexico's economy is in shambles and therefore the president at the time, Benito Juarez, suggests that Mexico stop paying any external debt due to the dire economic situation. Some of the top players at this time are President Benito Juarez, General Ignacio Zaragoza and General Porfirio Diaz. The French decide that they will "help" Mexico with their situation and come over to the country in battleships to "help out." It is quickly discovered that the French want to march onto Mexico City and declare the country as part of the French monarchy. The battle then becomes "President Juarez and his Liberation Army" vs the "French Army" and some aristocratic sympathizers as well. Mexico is well outnumbered by the French Army, one of the best armies in the world at the time. My political question of the day is: Where is Mexico's army today? Don't we see history repeat itself from time to time? I would assume that the French still hold one of the most impressive armies in the world, however we never hear about the Mexican army. In the movie, they speak of the Mexican ejercito, which is the Spanish word for army. 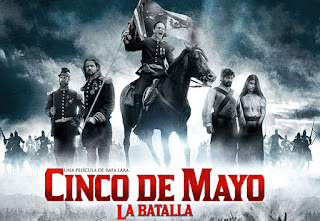 The movie "Cinco de Mayo: La Batalla" is a foreign film, made in Mexico, and it has English subtitles. Following the lines of a typical war movie, we see the same coverage of a war such as "Saving Private Ryan" a movie where we follow some strategic battles, injured soldiers, hunger, excruciating weather conditions, women assisting as nurses, losing of ammo and remembrance of famous soldiers. All these factors are what made the movie so exhilarating and any history buff such as myself would highly enjoy the film. I won't ruin the ending but we do see a small clip of President Abraham Lincoln towards the end of the film. Did Mexico win the war? What role does the USA take on this war? You'll just have to see the movie to find out!